PLEASE NOTE. 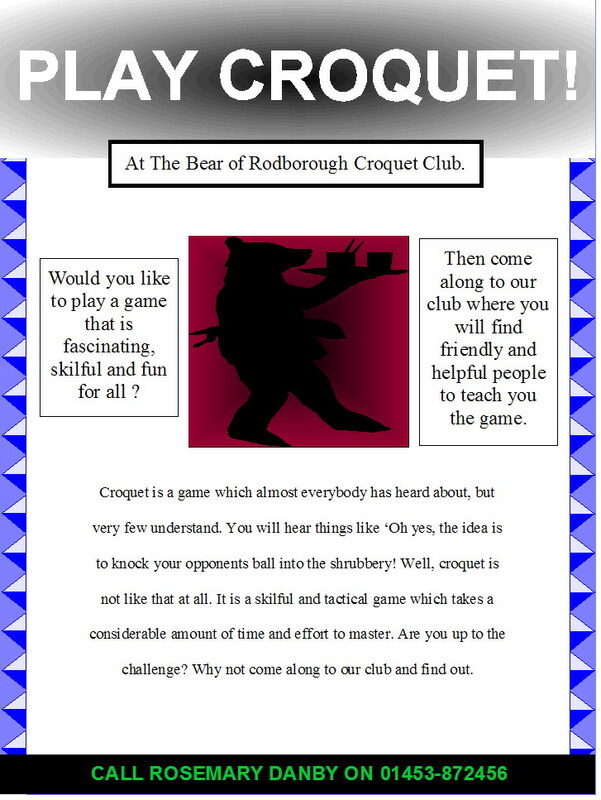 Our club has now ceased to operate from the Bear of Rodborough Hotel and we are actively seeking a new venue. For the time being we are simply calling ourselves The Bears. I am not changing the web pages until we have a new location. In the meantime please ignore any references to the Bear of Rodborough Hotel. For enquiries please email me at don@faydon.com (Don Gaunt,Webmaster). The BoRCC meets on Wednesday and Monday evenings throughout the season (approx May to October). You are free to "come and try it" or, if you prefer, just watch. Someone will be happy to explain the rules to you. Here is a flyer for the club. Click on the image to enlarge/reduce it. On our Wednesday and Monday evenings, play is very informal. As far as is possible, anyone who turns up can join in. The emphasis is on a social occasion and with the bar of the hotel a few yards away, this is made very easy! We do, however, have some more serious club events. There is a singles and a doubles knockout. These are played in a handicap format to try and give everyone a fair chance of winning. There is also a knock-out event for a simplified version of the game called golf croquet. Click on this link to see the winners of our club competitions since it all began. In 1984 the BORCC was formed. To mark the occasion in 2009, we held some special events. To find out what they were, click on our Silver Jubilee page. This page also contains Don and Faith's Jubilee bear quiz - how much do you know about bears? Once a year, the Bear pays a visit to another club, sometimes in the UK, sometimes abroad. 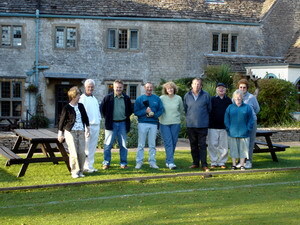 The purpose of the visit is to promote friendly relations with a mixture of croquet and social gatherings. To date we have had about ten of these trips, Click on this link to see pictures and stories of our trips. Note that there are no "results" because scores are not important. Over the years I have written various tips and suggestions to help others, particularly beginners and improvers. I have put those that survive on a page called Useful files. Please note that the files are in pdf format so you will need an Adobe Acrobat® reader to read them. This page is a tribute to Fernando de Ansorena.